For as long as the human species persists, it will remember the events of July 20th, 1969. On that day humankind reached a milestone in its evolution by landing two astronauts, Neil Armstrong and Buzz Aldrin on the surface of another world — the Moon. The event is beyond famous, even for those who were not alive at the time. I would have been five years old but have no recollection of that first landing, though do vaguely remember the reporting of later missions, since NASA’s Apollo program continued until the end of 1972. 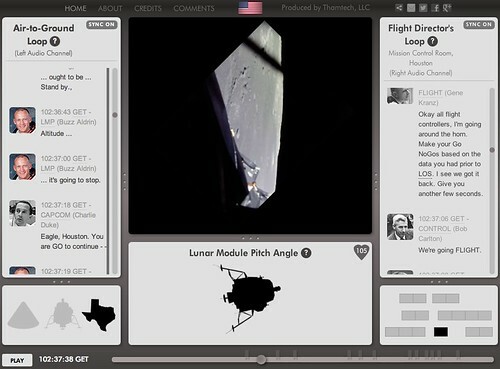 We have all heard Armstrong’s immortal words and seen the grainy footage but a website put together by Thamtech LLC now allows you to follow the drama of the final 20 minutes of the descent to the lunar surface, watching out of the window of the lunar module and listening in to the radio chatter between the control room in Houston, Armstrong and Aldrin in the Eagle and Mike Collins in the command module orbiting the Earth. The voices are remarkably calm given the momentousness of the occasion, the tripping of alarms in the Eagle and the fact that the astronauts touched down with less than 30 seconds of fuel remaining. Some listeners might be put off by the impenetrable jargon in the exchanges between the astronauts and ground control but I was captivated: this was history in the making. Not to me, I’ve spent years studying the Saturn V and the lunar landing process, therefore impenetrable is an incorrect word.